Santa Monica’s quality of life ranks high, making it one of Southern California’s most coveted places to live. People move to Santa Monica to be close to the beach, to enjoy a more relaxed lifestyle, and to take advantage of all its first-rate amenities. Did you know it is regarded as one of the ten most sustainable cities in the country? City buses run on natural gas, government vehicles run on alternative fuels, and all buildings must comply with green building codes. Bike paths are plentiful and they crisscross every part of the city. Santa Monica, nearby Venice, and Alsace have collectively earned the nickname "Silicon Beach." In recent years, many tech firms moved to Santa Monica - from startups to large internet companies - all looking to locate their regional offices here. The increased demand for workers has been a driver of housing growth in recent years both in terms of the pace of construction and the increase in home prices. The City of Santa Monica provides law enforcement services separate from the City of Los Angeles. There are two hospitals and top-notch public transportation services (The Blue Bus and Metro Trains). The Santa Monica Municipal Airport (SMO) is convenient for aviation enthusiasts and aircraft owners. Planning to move to here? Search all Santa Monica homes for sale. 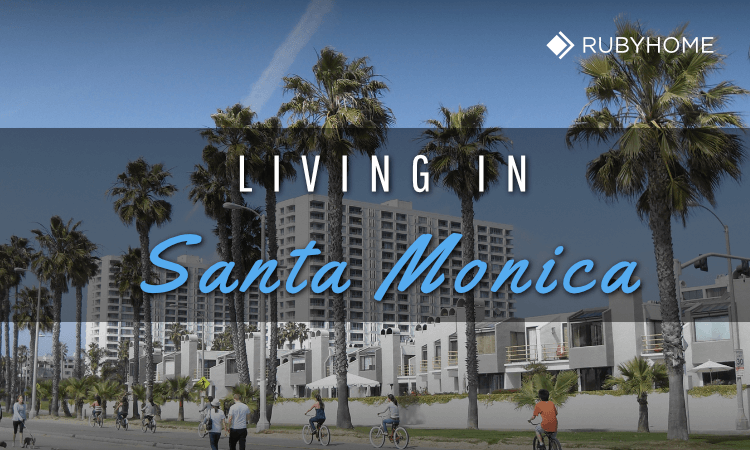 Purportedly named after Saint Monica by Spanish explorers in the late 1700s, Santa Monica has been fondly called “City of Inspiration” or “City by the Sea” over the years. Founded in 1875 by mining tycoon Senator Jones, Santa Monica was then incorporated in 1886. It experienced a boom in the 1920s and another in the 1960s when the Santa Monica Freeway opened. Today, the city is home to more than 90,000 people. Santa Monica is a beach town at heart. It was built and promoted as a resort destination in the early 1900s when amusement piers were popular, attracting vacationers and well-heeled Easterners looking to resettle in The West. Tourism was Santa Monica's core economy in its early years which an unpredictable source of revenue and subject to broader economic conditions. Not surprisingly, SaMo was hit especially hard by the Great Depression. But it didn’t remain down for long. The town transformed into a modern, first-class city over the remainder of the 20th century. A few key events pulled Santa Monica forward to become what it is today. 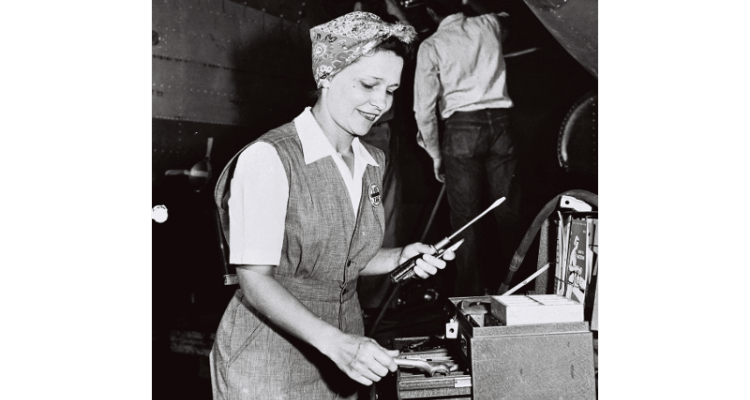 First, Douglas Aircraft Company (later McDonnell Douglas) built planes at Clover Field as a part of the war effort (WWII), employing up to 44,000 people. The Postwar boom in civil aviation kept manufacturers across Southern California busy cranking out aircraft. Next, in 1966, the completion of the Santa Monica Freeway connected Downtown Santa Monica to the rest of Los Angeles County’s massive freeway system, increasing access to and from the area at an ever-faster clip. And people loved it. Lastly, in the 1980s, the city’s revitalization efforts to the improve the downtown area continued to foster growth and bring prosperity. Today, Downtown Santa Monica is a business district, vibrant shopping center, and entertainment hub. Santa Monicans frequent casual neighborhood restaurants and farmer's markets and enjoy a variety of outdoor activities. Maintaining an active lifestyle here is easy. The beach is an obvious recreational choice for many. But dig in a little deeper, and you will find several jogging/cycling paths and pocket parks, too. Santa Monica boasts four weekly farmer's markets including Downtown Santa Monica’s Wednesday and Saturday markets, Pico Farmers Market and Ocean Park Sunday Market. These markets have received high praise for their fresh produce and flowers. In fact, they’ve been rated the best in the country by Travel+Leisure Magazine. The main branch of the Santa Monica Public Library is located in the center of Downtown, and four other branches reside in the Pico, Montana, Ocean Park and Fairview neighborhoods. You’ll never be far from a quiet place to study, take a class, join a book discussion, or check out a book. Santa Monica State Beach stretches 3.5 miles north and south of the Santa Monica Pier. It has a paved path for biking and running and a beautiful beach for surfing, volleyball and picnics at the beach. Annenberg Community Beach House, along with several private clubs, are also located here. Santa Monica State Beach was home the original Muscle Beach that sat just below the pier before moving to nearby Venice Beach. However, a fitness area still remains with several workout areas and outdoor fitness stations. South of the pier, Venice’s Muscle Beach has been fixture since the 1930s with its extensive outdoor gym and boardwalk lined with eclectic stores. North of Santa Monica, Will Rogers Beach provides the locals with a less crowded option. If you’re not biking there, expect to pay a nominal parking fee for the day. Palisades Park is a 26.4-acre park situated atop the bluffs along Ocean Avenue. Visitors love the view and locals a come here for a daily run, bike ride, yoga session, or to enjoy sunset view. Situated at Ocean Park and 25th Street, Clover Park has a plethora of activities for kids and adults alike. With a baseball field, basketball court, tennis courts and two playgrounds, you can stay all day. And it's a relaxing spot for a picnic or BBQ. Douglas Park has lawn bowling, tennis, and a grassy knoll nestled above a duck pond. Located at Wilshire and 25th Street, this park even has a clubhouse available to rent for private events. Tongva Park is located on Ocean Avenue only minutes from the beach and Santa Monica Pier. It has multiple climbing structures and a splash pad for kids, with stunning overlooks of the beach to enjoy at sunset. The Santa Monica Stairs draw folks looking for a cardio workout that is guaranteed to make them “feel the burn.” Two sets of stairs are available, a metal set at 4th Street and Adelaide Drive and a wooden set 500 feet up Adelaide between 4th and 7th. Just north of Santa Monica in Pacific Palisades, the 186-acre Will Rogers Park is a prime spot for hiking, with a 2-mile loop to Inspiration Point or longer hikes along the Backbone Trail. You can also ride horses here, which is how the park’s namesake Will Rogers preferred to experience it. And if you bring your dog, make sure it is on a leash or risk getting a fine. Since the late 1800s, Third Street Promenade has been the main shopping district in the city. Through this bustling open-air shopping center, you will find national clothing, sporting goods, and homeware brands. Charming cafes, restaurants, gourmet coffee shops, and bakeries also line the walkway. There are three movie theaters and an arthouse theater on 2nd Street. Adjacent to Abbot Kinney, Santa Monica's Main Street district offers an array of boutique stores and restaurants. There are also some luxury hotels nearby, including Casa Del Mar and Shutters on the Beach, both of which offer gorgeous terraces and beachside dining experiences. Montana Avenue houses upscale boutiques and mainstay restaurants, including several Italian classics and the neighborhood favorite, Father’s Office. Yoga and Pilates studios also line this street. With ample free parking just off the 1-10 and 26th Street, Bergamot Station offers the SaMo community more than 40 art galleries to peruse. Weekly events include receptions, screenings, talks and pop-up events. Adjacent to Santa Monica, Venice’s famous Abbot Kinney district caters to both the Silicon Beach and artist communities. The street is full of funky cafes and pop-up shops mixed with fine dining and high-end boutiques. It also hosts First Fridays each month, with food trucks, happy hour specials and other special events. The Santa Monica Pier (1909) is a huge tourist attraction but also a favorite venue for locals, especially for its wildly popular summertime Twilight Concert Series.The pier also hosts open-air movie screenings, drawing the whole Westside community to the downtown area. The Pier houses Pacific Park, a colorfully-lit, solar-powered Ferris wheel that juts high into the air. It is the most visible part of the pier and can be seen from many miles away at night. An early pier attraction, the Santa Monica Looff Hippodrome (carousel), is a National Historic Landmark. Harvelle’s Santa Monica is the oldest music venue on the Westside (est. 1931), famous not only for its blues and jazz shows but also for its weekly burlesque performances. The Santa Monica Playhouse has been a part of the Downtown scene for over 50 years. It is a true gem, perfect for an intimate live theater experience. Its calendar of events ranges from musicals and plays to holiday specials and kid-friendly shows. 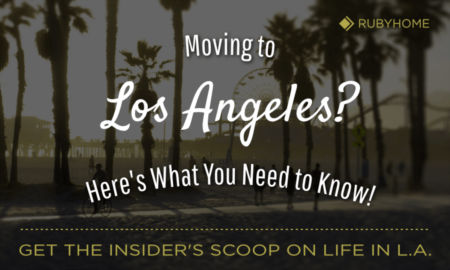 Every wonder where to live in Santa Monica? There are eight core neighborhoods, each with distinct character based its history, architecture, density, and proximity to the beach. Santa Monica is one of the best suburbs of Los Angeles, an affluent and highly desirable city. Thus, living in Santa Monica is not cheap; home prices are well above the Los Angeles County average. Downtown Santa Monica is a busy place with lots of people and cars. 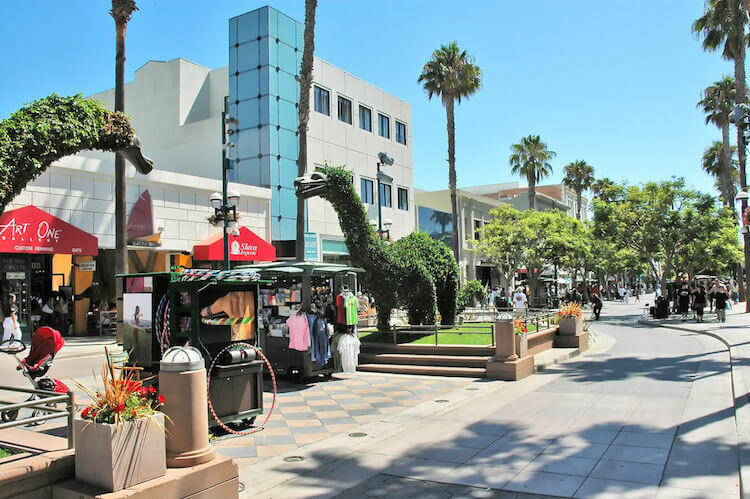 The Third Street Promenade, a pedestrian-only outdoor mall, and nearby Ocean Avenue get packed with foot traffic from locals and tourists alike. Attractions like the Santa Monica Pier and Santa Monica State Beach bring a heavy flow of people to the downtown commercial core, especially on weekends. Ocean Avenue is the main drag of Downtown that runs parallel to the coastline. It is wide and lined with restaurants and hotels. Palisades Park runs along the avenue’s western edge and includes walking paths, park benches, and superb ocean views. The downtown area rests on cliffs above the beach, giving the vistas a little extra horizon. Downtown Santa Monica that offers most urban, or compact, lifestyle. Residents get convenient access to public transportation that will take them in any direction. Entertainment venues, movie theaters, cafes, restaurants, and bars are just steps away. In addition to the nearby beach, a few pocket parks also provide places to chill and decompress. Most of the homes for sale in Downtown Santa Monica are high-rise condos and townhomes. Mid-City (a.k.a. Mid-City West or Midtown Santa Monica) is a low-key part of town. It’s a narrow section of Santa Monica that runs from Downtown to Centinela Avenue. Two main thoroughfares, Wilshire and Santa Monica Boulevards, form two of its borders. Restaurants and retail shops line both of them. Daily errands in the neighborhood are a breeze. The ever-packed Whole Foods sits on Wilshire. A UCLA Medical Center and St. John’s Hospital, two highly regarded medical facilities, are in the neighborhood. The Santa Monica Public Library, another cherished resource, sits in the Mid-City district. The housing stock in Mid-City Santa Monica consists primarily of condos and townhomes with a few single-family homes interspersed. Condos and townhomes comprise most of the available homes for sale in Mid-City Santa Monica. However, house hunters will find a few single-family homes interspersed. North of Montana runs from 26th Avenue down to the Pacific Coast Highway (PCH) and sits between Montana Avenue and the gently curving, coral tree-lined San Vicente Boulevard. Upscale shopping district Montana Avenue abuts the neighborhood's southeastern border. It is known for its many chic boutiques stocked with apparel, gifts, and home décor. The district sports plenty of restaurants and is an excellent area to hunt down and quaff third-wave espresso. The westernmost part of the area is near the beach on bluffs above the PCH, overlooking the Pacific Ocean. The high-rise condominium buildings along the cliffs have unparalleled, front-row views of the ocean and coastline. Some of the most expensive real estate in Santa Monica is found in the North of Montana neighborhood. Luxury homes have big and beautifully landscaped yards; the average lot size here is 8,971 square feet. Even larger estates can be found north of San Vicente Boulevard. Click here to search homes for sale North of Montana. Northeast Santa Monica runs from Centinela to 22nd Street between Montana Avenue and Wilshire Boulevard. Its northwest border abuts the Brentwood Country Club. Most folks drive right past the Northeast SaMo neighborhood without giving it a second thought. In many respects, it’s a quiet neighborhood with nothing flashy to catch one’s eye. However, there are several unique gems here like Douglas Park's lawn bowling green, home to the Santa Monica Lawn Bowls Club. And the park’s most unique amenity - one you won’t find in any other nearby park - a fly fishing area! Franklin Hill sits at the northeast corner of the district, and its elevation gives homes along the west side of Franklin Street killer views all the way to the ocean. Conversely, homes on the east side of Franklin Street have excellent city views, which are particularly beautiful at night. A few of the multi-story homes on top of the hill get a full 360-degree view of the L.A. Basin and Santa Monica Mountains. Another great feature of the neighborhood: a green belt runs between Wellesley Avenue and South Carmelina/Centinela Avenue. It is a wooded ravine, and the homes that run along either side of it have a forested backyard, plenty of shade, and privacy. Large property lots in Northeast Santa Monica are the norm, a real bonus for people who love having a yard. Check out the homes for sale in Northeast Santa Monica. In many ways, Ocean Park is the soul of Santa Monica. The neighborhood is a little less ostentatious than some of the pricier areas of the city and certainly less touristy than nearby Downtown SaMo; it has a laid-back vibe more fitting of a beach community. Main Street runs north/south through the heart of the neighborhood. High-end boutiques, casual bars, patio cafes, and international restaurants line the busy shopping district. Ocean Park is known for being very pedestrian and bike-friendly. In fact, the weekly farmers market has a bike valet to keep track of all the of beach cruisers that descend on Ocean Park, storing them in an orderly manner. Ocean Park has the liveliest nightlife in SaMo, attracting a younger crowd. Residents can burn off any extra calories from last night’s margaritas with an early morning surf session or exercise class - cycling and yoga being the two most popular. The housing stock in Ocean Park is a mix of condos, townhomes, and single-family homes. Inland from the beach, Bungalow, Craftsman, Mid Century Modern, and Spanish-style homes dominate. If you keep a close eye on the local real estate market, occasionally you will find pristine turn of the century beach homes for sale. Click here to search homes for sale in Ocean Park. 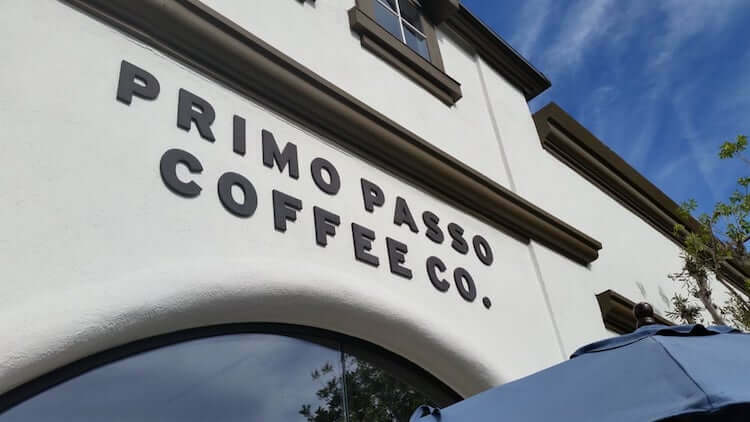 Pico District is another mellow neighborhood of Santa Monica. Its divided down the middle by the 10 Freeway. The district has two notable parks, the smaller Gandara Park and the much larger Virginia Avenue Park (9.5 acres). Virginia Avenue Park hosts one of Santa Monica farmer's markets every Saturday from 8 am to 1 pm. The Community Center offers after-school programs for teens and has excellent athletic facilities that include two regulation basketball courts (lighted for night games), a playground, a splash pad, picnic tables, and a patio. The sprawling, five-acre Bergamot Station holds 25 tenants in 62,000 square feet of building space. Occupants include architects, galleries, a florist, the Bergamot Café, and the City Garage Theater. The city-owned arts complex has free parking and conveniently sits right on the Expo Line. It is open daily. Most galleries operate Tuesday – Saturday, 10:00 am to 6:00 pm. Like many working-class Westside communities, prices for homes for sale in Pico District in continue to rise at an accelerated clip. Sunset Park is home to two venerable institutions, Santa Monica College and Santa Monica Airport. The neighborhood is chock full of Bungalows and smaller single-family homes, many built to fulfill housing demand for factory and white-collar workers at McDonnell Douglas in 1930s and 1940s. At that time, Santa Monica Airport was Clover Field. Beginning in the early 2000s, the Sunset Park district began transforming into an upscale neighborhood vis a vis what one might call “mansionization.” Developers happily tore down modest 1,000 square foot homes and replaced them with 3,700 square foot luxury homes. This still happens today; there is never a shortage of buyers who want to move into the neighborhood who prefer larger homes. Click here to see the latest homes for sale in Sunset Park. 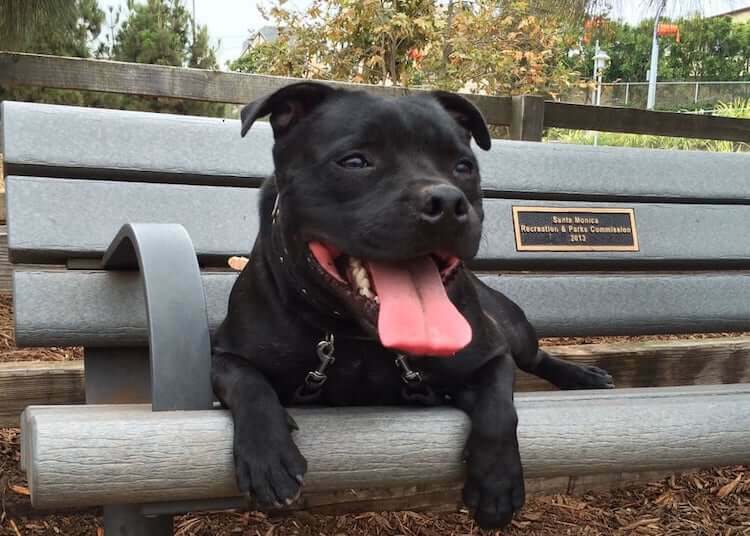 Airport Park has an excellent synthetic turf sports field, off-leash dog park (with separate areas for small and large dogs), playground, picnic tables, and BBQ grills Two smaller parks in the neighborhood, Clover Park and Marine Park, get their fair share of use, too. Wilshire Montana (a.k.a. North of Wilshire) stretches from Centinela Avenue to the Pacific Coast Highway between Montana Avenue and Wilshire Boulevard. The northern border shares the Montana Avenue shopping district which offers plenty of boutiques and high-end stores. 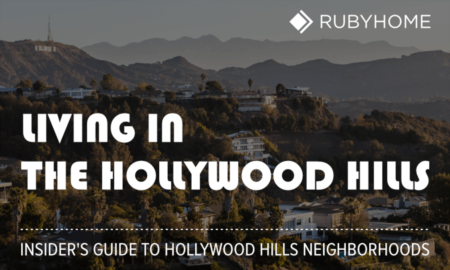 Because two main thoroughfares (Wilshire and Montana) run the length of the district, you can fan out in any direction to dine or shop. Residents at the southwest corner of Wilshire Montana live just steps from Third Street Promenade, which opens up an even more expansive set of dining and entertainment options. 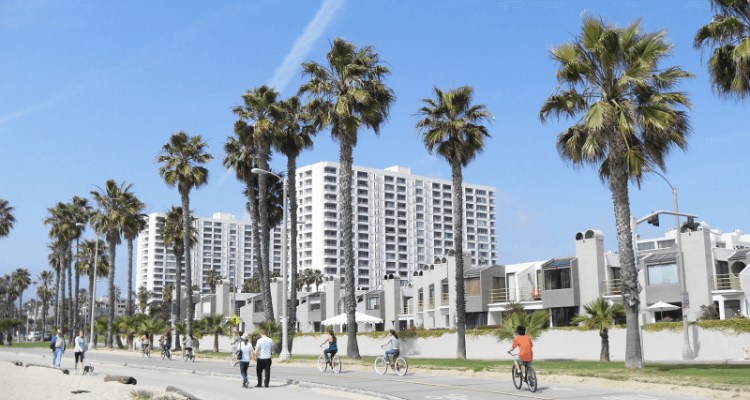 The housing stock in the district is comprised primarily of condos and townhomes; it’s one of the few places in Santa Monica where the number of multi-unit homes exceeds single-family homes. Condos and townhomes are more expensive in the Wilshire Montana neighborhood when compared to the surrounding Santa Monica neighborhoods, but not as pricey as the properties in the North of Montana neighborhood next door. Click here to see the homes for sale in Wilshire Montana. Santa Monica-Malibu Unified School District (SMMUSD) operates the public schools in the city and to communities north of town, up to and including Malibu. Not only does it cover a lot of ground, but it also serves over 11,000 students. The district is recognized for its educational excellence and is ranked by U.S. News and World Report. Three schools have earned National Blue Ribbon Schools honors. SMMUSD has a handy map finder tool to look up schools by street address. Santa Monica residents also have a choice to send their kids to any one of eleven local private schools. There is one public junior college in town, Santa Monica College. It serves over 30,000 students and offers classes in 90 academic fields. It operates the main campus on Pico Boulevard and five satellite campuses. It is also home to the ever-popular KRCW radio station. Be sure to check out Santa Monica houses for sale. 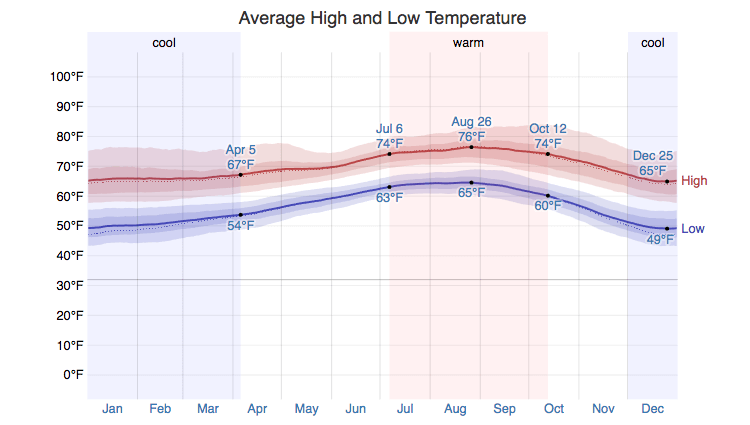 Santa Monica has a mild weather, revitalizing ocean breezes and sunshine on most days. Beware the marine layer; summer temperatures are usually chilly compared to inland communities, say 72 degrees. That’s the small price one pays to live near the water. Rapp Saloon (1875) is Santa Monica’s oldest structure. This masonry building first opened its doors as a beer hall and later became the city’s first City Hall. In the 1930s, Santa Monica had a brief stint as the city’s prime location for filming. But directors looking for a perfect daytime shot found that waiting for the fog to burn off was a time waster, so they moved east to Hollywood. Initially designed to protect the sewage pipe dumping treated sewage into the Pacific, Santa Monica Pier’s Pacific Park is one of the city’s most popular attractions, with its 160,000 LED solar-powered Ferris wheel towering above.